HARE, Jan, and Jean BARMAN — Good Intentions Gone Awry: Emma Crosby and the Methodist Mission on the Northwest Coast. BUMSTED, J. M. — St. John's College: Faith and Education in Western Canada. BECKER, Peter, and Richard F. WETZELL (eds.) — Criminals and Their Scientists: The History of Criminology in International Perspective. LARIN, Robert — Canadiens en Guyane, 1754–1805. 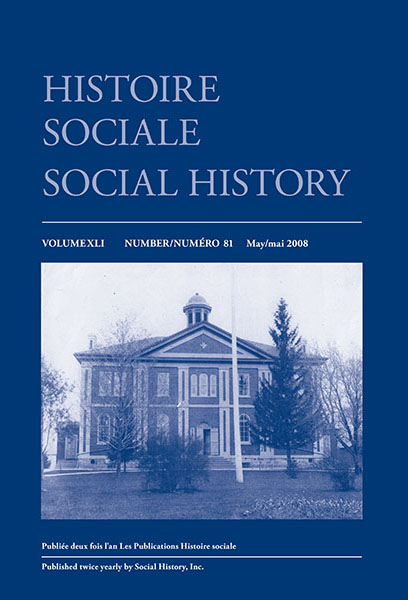 MARSHALL, Dominique — The Social Origins of the Welfare State: Québec Families, Compulsory Education, and Family Allowances, 1940–1955, translated by Nicola Doone Danby. SCHWEBER, Libby—Disciplining Statistics: Demography and Vital Statistics in France and England, 1830–1885. DAVIES, Peter — The Debate on the French Revolution. BURROWS, Simon — Blackmail, Scandal, and Revolution: London’s French libellistes, 1758–92. MARTEL, Marcel — Not This Time: Canadians, Public Policy and the Marijuana Question 1961–1975. ZANASI, Margherita — Saving the Nation: Economic Modernity in Republican China. JEFFRIES, Judson L. (ed.) — Black Power: In the Belly of the Beast. | LAZEROW, Jama, and Yohuru WILLIAMS (eds.) — In Search of the Black Panther Party: New Perspectives on a Revolutionary Movement. LOEWEN, Royden — Diaspora in the Countryside: Two Mennonite Communities and Mid-Twentieth Century Rural Disjuncture. SUTTON, Matthew Avery — Aimee Semple McPherson and the Resurrection of Christian America. QUESTIER, Michael C. — Catholicism and Community in Early Modern England: Politics, Aristocratic Patronage and Religion, c. 1550–1640.